Buckeye Wildlife Solutions solves conflicts with bats and people. We are experts at remediating bat problems. BWS keeps bats out with the notion of securing the safety of your family. We are proud to offer humane solutions to all bat problems. 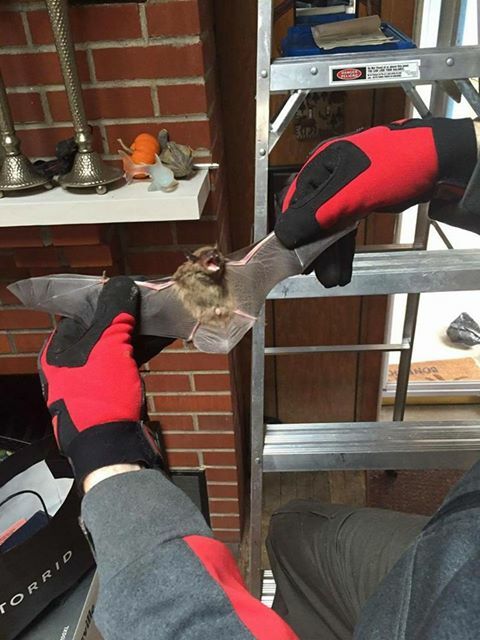 No bat will be harmed during our live bat removal process. Bat proofing and extermination services are GUARANTEED – backed by a written warranty. 100% Written Guarantee On Bat Removal. Competitive Pricing Compared To Our Competition. We Get The Bats Out, And Keep Them Out! BWS Obtains All Proper Licensing & Insurance. Bats enter attics through ridge vents, attic vents, chimney flashing, damaged soffits, exposed dormers, & drip edges. Screening these areas off helps keep the bats out permanently. Columbus harbors 11 different species of bats. The live-exclusion process remains the same no matter the species of bat or size of colony. We are confident in providing our customers a minimum 1 year warranty on all bat removal services in Columbus OH & surrounding areas. Big Brown Bats are the most common bat species we deal with around Central Ohio. Unlike most species, Big Browns tend to hibernate in your attic during the winter, while others such as Little Brown Bats and Evening Bats will leave in the fall time, migrating back to caves in gigantic colonies, and then return in the spring. There is potential for a MOUNTAINS of bat guano to accumulate when a large colony is infesting your attic. For this reason Buckeye Wildlife Solutions also provides waste clean up and attic reconditioning services. Attic restoration takes place after the bats have been evicted from the attic, ensuring your new attic remains spotless. During our initial inspection we locate the main entries bats are using to enter your attic. Bats enter attics from a multitude of areas. Primary entries can be identified from evidence of bat droppings or grease stains. Our modo is to be perfectionists with bat removal. We leave no stone unturned or else the bats will get back inside your attic. Bat exclusion is performed by installing one-way valves or netting over the bats main point of entry. This will allow the bats to fly through the device, and upon returning our devices will block the bats from reentry. Once the bats realize they cannot get through their usual spot, they will fly around the home in search of another entry. Bats have the 2nd best hearing of mammals in the animal kingdom right behind Dolphins. Their echolocation hearing is so complex it allows them to pinpoint drafts coming from exposed entrances. For this reason we make certain all gaps leading to the attic have been properly sealed with quality materials. If you are reading this article, you are probably experiencing bat problems. You do not deserve to have this problem, but sometimes it’s just the luck of the draw. Unfortunately it can be an expensive issue to solve, but the fact of the matter is every home is susceptible for bat infestation. Bats will 100% be able to enter any home that has not been bat-proofed. It’s just one of many pest related inconveniences every homeowner will come across eventually. Not to worry! Our team is here to provide permanent solutions to every homeowner in Columbus Ohio. Our experience in removing bats has made us masters of the trade. Call today and let us educate you regarding your bat problems. Zip Codes – 43040, 43017, 43015, 43065, 43026, 43123, 43035, 43064, 43209, 43221, 43081, 43082, 43085, 43011, 43041, 43044, 43045, 43060, 43061, 43066, 43067, 43069, 43074, 43081, 43102. # SEO Article Keywords | Bat Removal Columbus OH, Bat Removal Dublin OH, Bat Removal Powell, Bat Control Hilliard, Bat Removal Delaware, Bat Guano Cleanup Columbus, Bat Waste Removal, Get Rid Of Bats Columbus, Bat Removal Specialist, Bat Problems, Bats In Attic Columbus, Bats In Chimney, Bat Removal From Attic Ohio, Commercial Bat Control, Residential Bat Removal, Bat Removal Company, Bats In Ceiling, Bats In Kitchen, Bats Roosting On Home, Bat Control Business, How To Get Rid Of Bats From Attic, Company That Deals With Bat Issues In Ohio, Bat Control Business Ohio, Controlling Bats, Bats In Eve, Bats In Belfry, Bats In Soffits, Bats On Roof, Bats Flying Around Property, Bats In Barn, Bats In Church, Emergency Bat Removal, Bat Removal Service Columbus OH.